Stuart & Stuart are proud to present this deceptively-spacious mid-terraced villa which boasts three/four bedrooms, two bathrooms and two reception areas, as well as enjoying a delightful expansive garden and access to unrestricted on-street parking. Desirably located within the charming coastal suburb of Portobello, just a stone’s throw from the beach. Set behind an enclosed cobbled garden, this charming stone-fronted villa opens into a practical vestibule flowing through to an airy hall with built-in storage. Here, an abundance of rich wood details creates a warm welcome to the home and remains a prominent feature throughout the accommodation. To the right of the hall is an immaculate living room lit by a westerly-facing bay window. In addition to softly-toned décor and carpeting, the room’s elegant feel is enhanced by a decorative fire surround, a display recess and an ornate ceiling rose. To the rear of the property lies a good-sized formal dining room, with further display storage, conveniently connected to the kitchen – an ideal, sociable layout for casual family meals and entertaining. Flooded with light from an elongated window, the superbly bright kitchen boasts an enduring, farmhouse-kitchen style, with an array of panel-effect cabinets, in a tasteful shade of clotted cream, paired with spacious timber worktops, rustically textured tiling and a deep Belfast sink. A freestanding gas cooker and a dishwasher also feature, whilst an adjoining utility room houses a tall fridge freezer and a washing machine. The utility room also leads onto the garden – handy for alfresco dining. 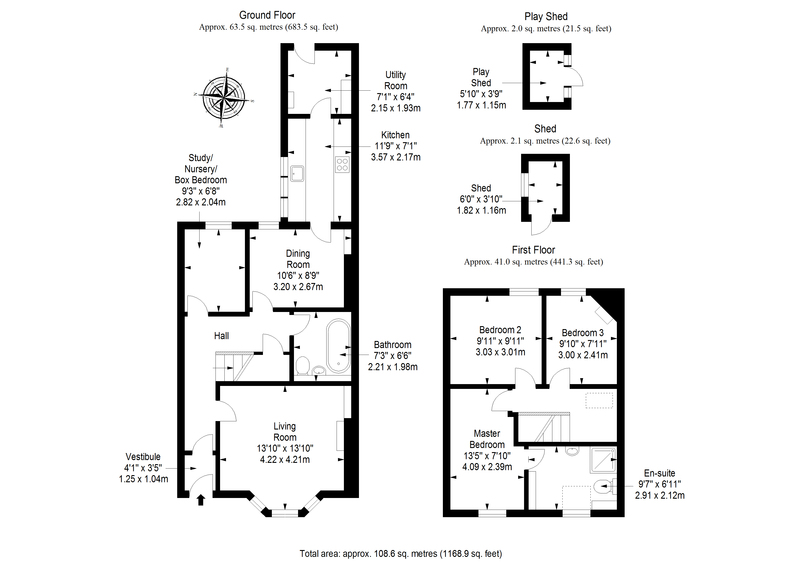 Completing the ground floor accommodation is a multi-purpose box bedroom (ideal as a study or nursery), and a family bathroom. Fully-tiled and appointed in a classic fashion, the bathroom features a WC, a pedestal basin and a sumptuous antique roll-top bathtub. Upstairs, a well-lit landing affords access to a master bedroom, accompanied by an impressively sized en-suite shower room, and two further well-presented double bedrooms, one retaining an enchanting wrought iron period fireplace. Gas central heating and double glazing throughout ensure a warm, energy-efficient climate all year round. Externally, the villa is complemented by a sizeable rear garden incorporating a neat lawn, well-stocked plant beds and two useful sheds. Unrestricted on-street parking can be found to the front of the property.